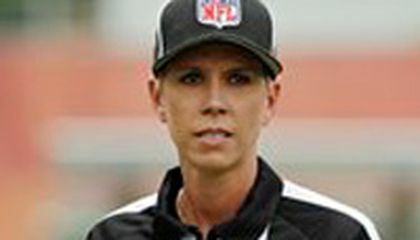 The NFL has its first full-time female game official and it is Sarah Thomas, who has worked exhibition games. The 41-year-old Thomas was in the league's officiating development program in 2013 and 2014 and worked some team minicamps last year. She's already broken ground in the officiating field as the first woman to work college games in 2007 and she will be a line judge for the 2015 NFL season, the league announced. She was the first female official on the FBS level and the first to officiate a bowl game, the 2009 Little Caesars Pizza Bowl in Detroit. "I am a female, but I don't look at myself as just a female," Thomas said last June while working a Cleveland Browns minicamp, "I look at myself as an official." Off the field, Thomas is a pharmaceutical representative and she said last June her two sons and one daughter see nothing extraordinary about her football job. Its great to see a woman as an official. Everyone thinks that woman cant to what men could well guess what now, we are doing something that "only" men do. Why aren't there many NFL female officials? Is it because not many want to do that job or is it because not many get the job. How many girls really like sports and would like to do the job but not everyone gets an opportunity.Foe Sarah Thomas to be a football official its really cool because that means that girls could do what ever boys can do its not because were girls we cant do anything we can. There is nothing wrong with having a female referee in the NFL. Text states "She's already broken ground in the officiating field as the first woman to work college games in 2007 and she will be a line judge for the 2015 NFL season, the league announced." Text also states "Thomas, a former college basketball player, was inspired to become an official in the 1990s when she attended a meeting with her brother, Lea. In 1996, Thomas became the first woman to officiate in a Division 1-A high school football game in Mississippi." Some football fans might not be okay with the decision from the nfl but this is history and fans will get used to it. It is about time! I think this is good because it symbolizes equality. However, I feel like she might run into problems because some players won't take her calls seriously. I think it is great for Sarah Thomas it shows that women are coing up in the world. This could also bring ore women into the nfl and other leagues. It's strange to me that this hasn't happened before. I did a little more research on female sports officials and referees and found out a lot about the few women who do it. In the NBA, a woman named Violet Palmer started being a basketball official in 1997. She has been doing her job for 15 years, and has refereed over 700 games. She was also one of the first women to be an NBA official. In the Ultimate Fighting Championship, which is the biggest mixed martial arts competition in the United States, Kim Winslow was the first female referee in 2009. There were also many others that I found, like Kheira Sidi Yakoub (World Series of Boxing), Amy Fearn (English Football League), Sian Massey (English Premier League), and Bibiana Steinmaus (German Soccer League). This is good to see. This is another step towards gender equality while not having gender superiority, which is what i personally would like to see. Certainly a job like this would be diffcult for a female to aquire, so it is certainly well-deserved. It's amazing that she is the first woman to be a referee. So this means that women's rights are jumping even higher and so maybe in the possible future there will be even more women who want to be a referee for the NFL or just for college, high school, etc. What is important about this is that are fans going to think this is wrong. 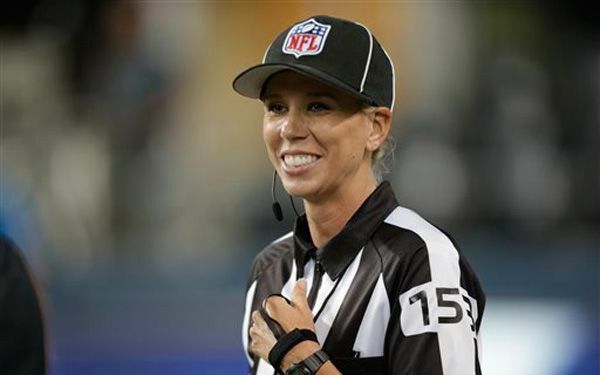 Will they discriminate Sarah Thomas for being a woman as a referee in the NFL. They are many good things that come out of this, but will there be the other fans who only want men to be referees and not women. It's great that a women can do anything if they want to! It shows that with hard work and passion a women can do things better than a man, even if it's at his own game.